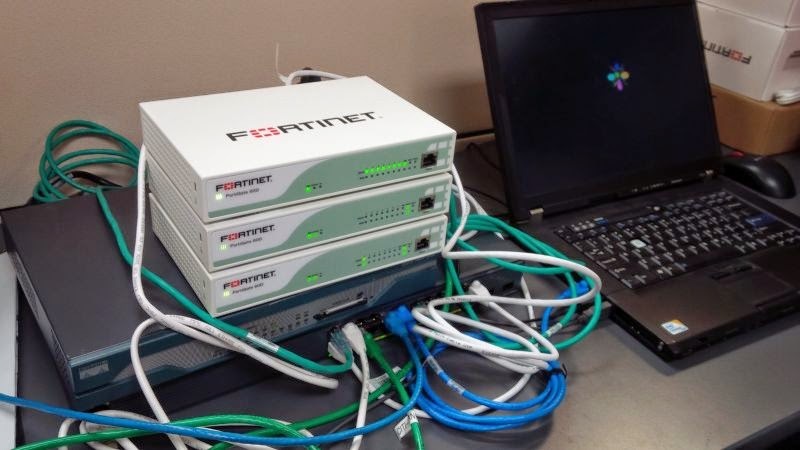 After tested policy based and route based IPSec vpn, this post will do a quick test FortiGate concentrator feature. 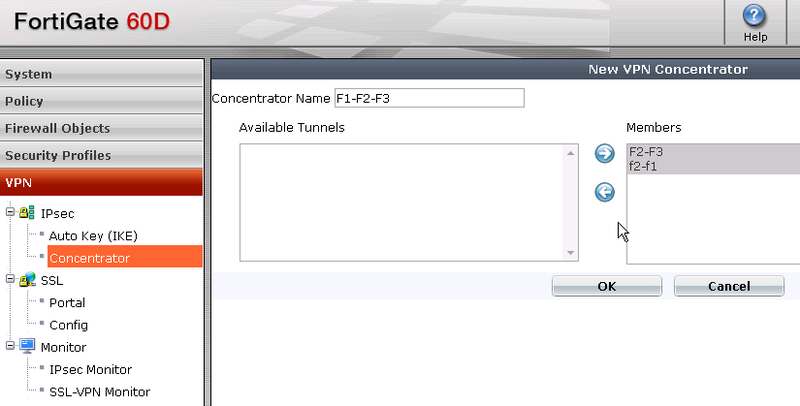 The VPN concentrator collects hub-and-spoke tunnels into a group.The concentrator allows VPN traffic to pass from one tunnel to the other through the FortiGate unit. The FortiGate unit functions as a concentrator, or hub, in a hub-and-spoke network. 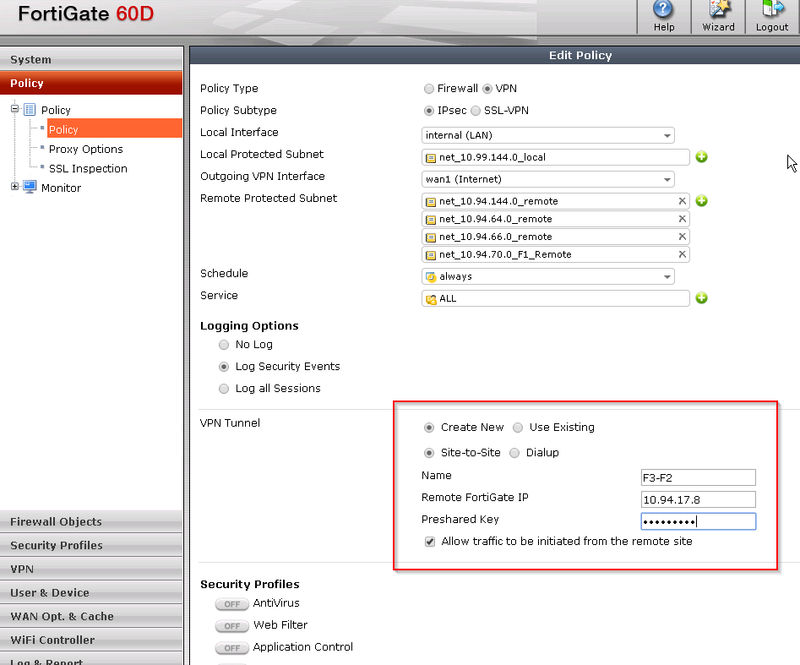 If the VPN peer is a FortiGate unit functioning as the hub, or concentrator, it requires aVPN configuration connecting it to each spoke (AutoIKE phase 1 and 2 settings ormanual key settings, plus encrypt policies). It also requires a concentratorconfiguration that groups the hub-and-spoke tunnels together. The concentratorconfiguration defines the FortiGate unit as the hub in a hub-and-spoke network.If the VPN peer is one of the spokes, it requires a tunnel connecting it to the hub (butnot to the other spokes). It also requires policies that control its encrypted connectionsto the other spokes and its non-encrypted connections to other networks, such as theInternet. FW3 adds into the our previous topology used in route based and policy based vpn labs. FW3 will act as another spoke , same as FW1. FW2 will be the hub , or concentrator. 1. 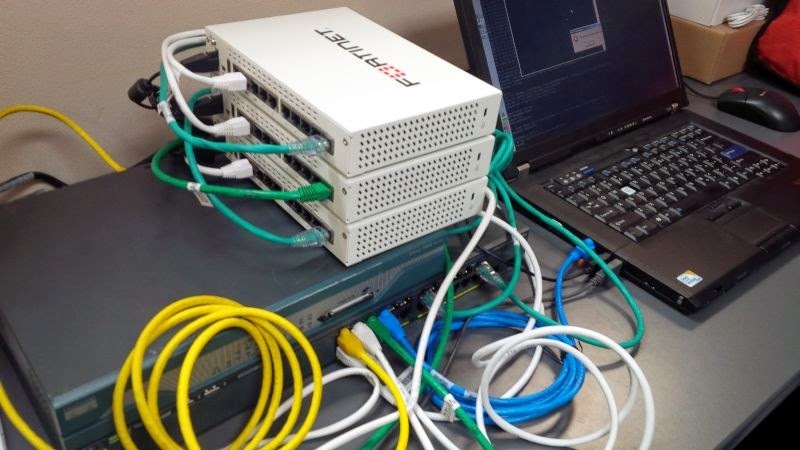 @F3: Since there is a vpn tunnel built between F1 and F2 from previous lab, the first step is going to build another vpn tunnel between F2 and F3. Create all local address object and remote address objects. Remote objects will include the protected network by F1 and F2. 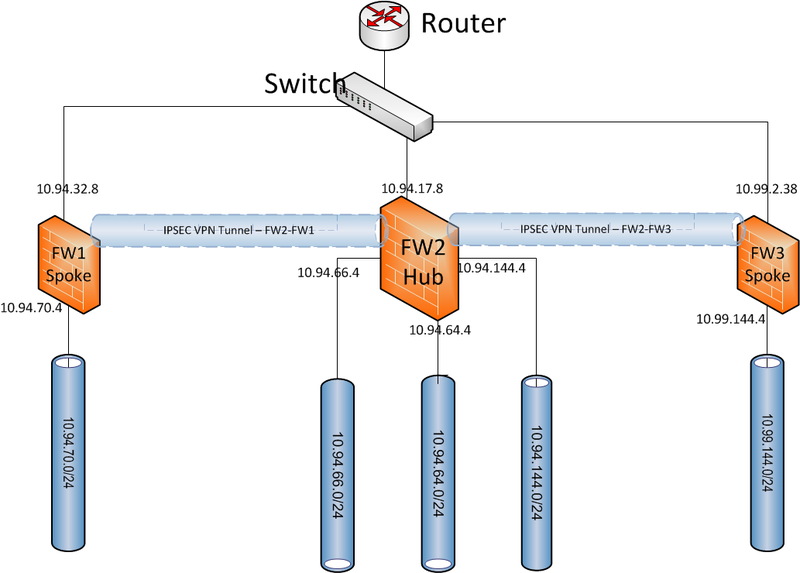 Create a new rule to allow local network to remote networks with a new ipsec vpn tunnel. 2. @F2. 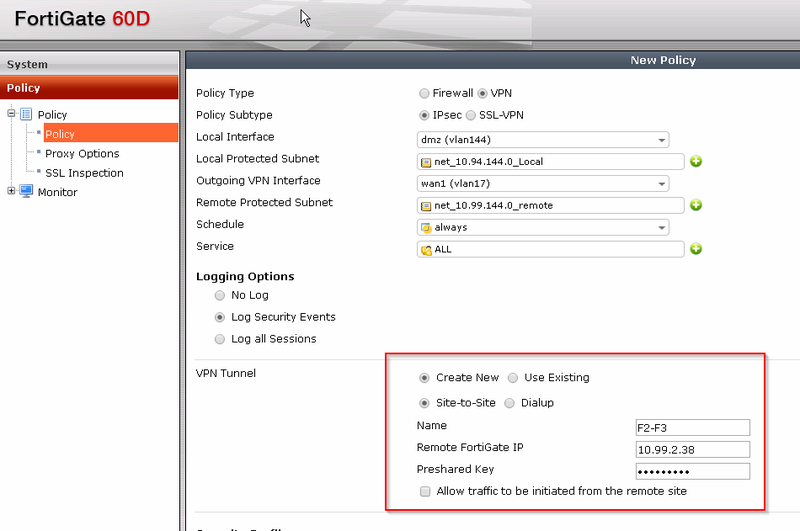 Create new policy rules with a new vpn tunnel betwee F2 and F3. Create new remote network for F3. Create a couple of new rules to allow local network to access remote F3's network using a new VPN tunnel F2-F3. Since there are three local networks behind F2, three new rules will be created. Note: There is no need to create rule to allow spoke traffic passing among them. In the VPN - IPSec - Auto Key (IKE), F2-F3 vpn tunnle profile will be there. At this moment, the tunnel between F2 and F3 is configured and should be up from IPSec monitoring tab. 3. Configure F1 for the traffic between two spokes , F1 and F3. Create a new Conentrator from VPN- IPSec - Concentrator. This is the test from F1's local network host 10.94.70.20. 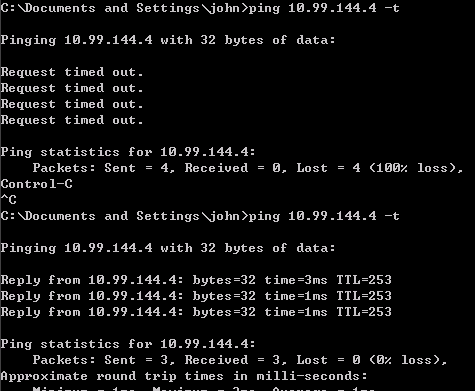 Before concentrator configured at F2, ping to 10.99.144.4 timed out. As soon as Step 4's concentrator configuration done, ping immediately replied.